Scrum – easy to understand, difficult to master, as the authors Jeff Sutherland and Ken Schwaber say. In established automotive organizations, introducing Scrum on a large scale is again a different challenge.In addition, you and your organization want to be more attractive on the employee market. We visit you – either physically or virtually – for two days to qualify in depth what you need. This allows you to tailor the training to your organization’s specific needs. Two full days Scrum Transition Boot Camp for all developers, held off-site. Minimum number of participants is 160. One-day training for designated Scrum Masters and Product Owners. Minimum number of participants is 20. Training for as many engineers as you need. Minimum number is 160, the training scales up to 1000 and more participants simultaneously. As many agile coaches to lead participants through the training as it needs. Anywhere in the world – we have done the training throughout Europe, Asia, and the Americas so far. Senior executive for the location who does a five-minute intro at the beginning of the first day. In-person briefing required on the day before. In software development organizations worldwide, Scrum is pretty widely accepted and adopted, especially in organizations that focus on web and app development. Scrum for Automotive is a different beast. Automotive software, be it on-board or backend, has its own peculiarities. The dependency on specialized hardware – ECUs or electronic control units – means that systems do not just run on software, but need sensor data as inputs, need actuators to influence the physical world, and rely on communication. All of which has to adhere to timing constraints and require thoughts of functional safety for many applications. Scrum for Automotive also is different because automotive organizations have decades of development and organizational legacy, which has to be accepted and integrated in a thoughtful manner. So even divisions transformed into agile organizations often continue to live inside classical organizations with classical product release cycles. Those organizations will not be able to handle new technologies like regular software updates over the air. Transformation of those comes more and more into focus, yet the gap remains: How to not just read about Scrum, but enable engineers and engineering teams to apply Scrum to their daily work? Elektrobit is used to combine the agile and the automotive world. We can help you to overcome this change. We guide you, because you are the experts! Besides theoretical basics and simulations, we want your input to commonly define the best-suited working mode and role responsibilities within your company/department. If you are an automotive engineering manager, an automotive software developer, any type of employee in an automotive world, you have been to numerous training classes with a dozen or so others from your company. You learnt something, and hopefully it stuck for more than just a few days and weeks. With Scrum, the stakes are higher. 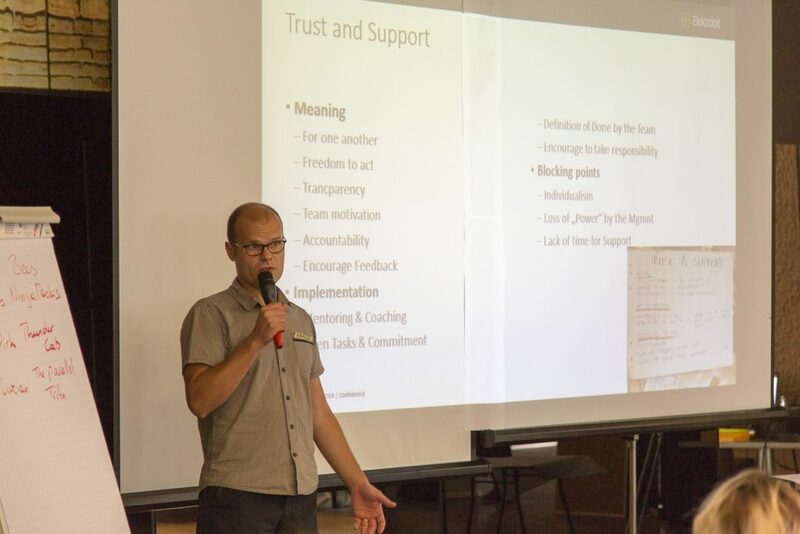 Since Scrum is a team-centric process, and since Scrum affects not just a piece of our work, but affects the structure of the organization, how we see ourselves in the organization, and the success of the organization itself, it takes more than just your normal training. 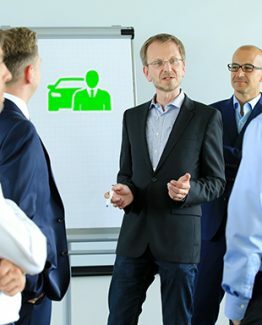 If you are heading an automotive organization that you want to transform and that you want to immerse into working with Scrum, you need to train your staff, yes. But more than that, you need to provide your organization with the idea that this is for real. You need to show them that this is not just yet another training, but this is the thing. You need to create collaborative experience within your employees, have them struggle together with Scrum and learn together the way Scrum can constantly deliver high quality product increments. We offer you to contribute to the definition of Scrum roles within your organization/department bottom up and with that, decide on your own what will be the best fitting role for you. You do not want to bring people together and “power point” them into unconsciousness. 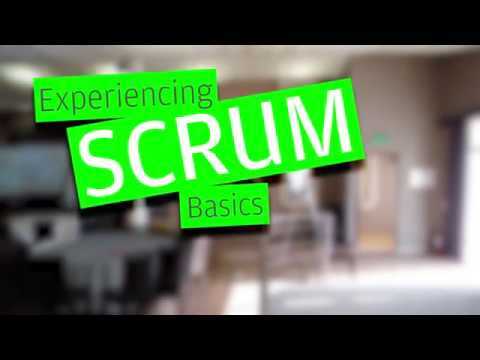 You want people to experience Scrum first-hand. Humans learn best with positive emotions engaged. 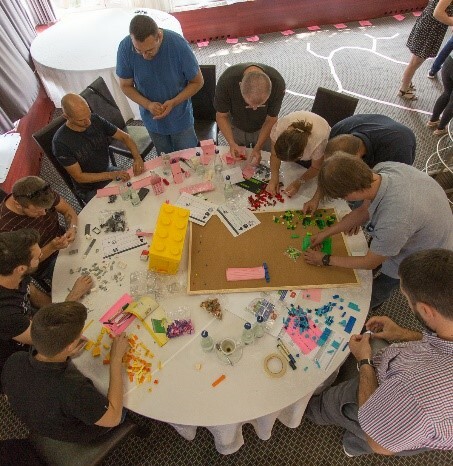 70% of this training is experiencing Scrum and the agile way or working in simulations and working groups, while interacting strongly with your colleagues. The evening of the first day we offer an open discussion about all the experiences you made during the day and deepen your learning. If you are the kind of manager who wants to have some real positive impact for your organization, if you have the stance to go bold and really transform your department, your division, your business unit, then do it like successful managers do: Make something happen. If you want to go Scrum, then really do it. You do not want to be remembered as the manager who took a year just to provide everybody with the basic Scrum knowledge? You would rather be remembered as the one who did it and transformed the way the organization works? Often the introduction of agile methods is recognized as lip service only. Use this event to make a clear statement to your engineers. 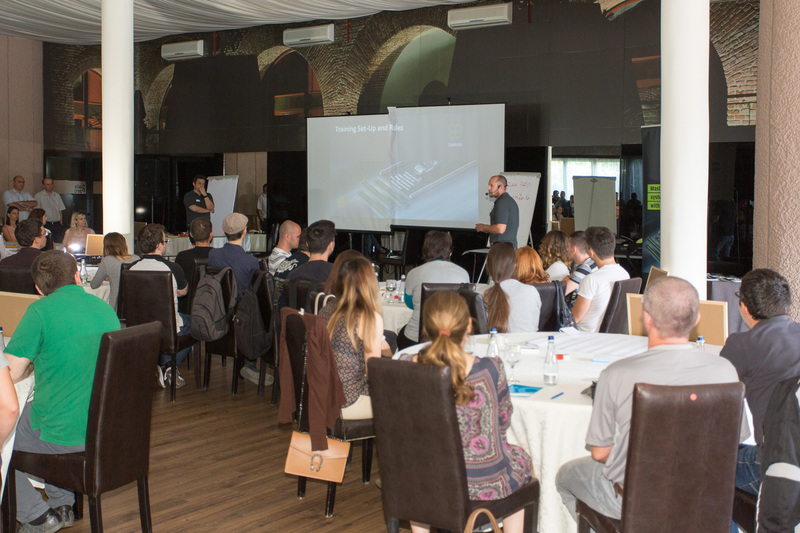 We provide Q&A sessions during the training, giving you the opportunity to address your engineers’ concerns. Use the evening slot to discuss topics with them. Show that you want to define with them the future collaboration model. Make this event the starting point within your overall agile transition, and tell your employees what will change from tomorrow on and paint the big picture of further transition steps. Combine this large-scale training with further training/coaching offers like Management Awareness or Leadership training classes upfront or deepen your teams’ expertise with SM/PO training, coaching sessions on software craftsmanship, conducting Coding Dojos or Hackathons, or adapt your continuous integration. You do not want to route engineers through small training classes one group at a time, for months and months. Instead, train everybody at once and multiply the effect. We offer to train your staff in big chunks in short time, even in regions around the world by the same set of trainers, making sure that there is a common level of training quality throughout your organization, adapted to cultural needs. We support you to prepare the training properly. Posters and blogs to inform your employees about what to come are available. Customize the training content in collaboration with the trainers upfront to focus on your specific needs. A business unit in one of our largest clients, Continental, was facing the same challenge like you do. Like we helped them, we will help you, closing the gap between Scrum theory, practice, and the challenges in your organization. 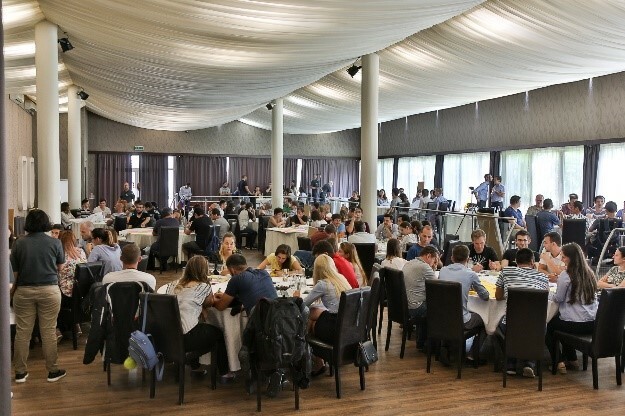 One of its kind, we bring together hundreds of people in a single room for two days and immerse them into Scrum for Automotive. We breathe and eat and work and sweat together, we see the stories and failures together, and we grow together. We unveil the good, the bad, and the ugly about Scrum and make it real. Some of the exercises are not just exercises but even produce outlines and results that your organization can directly use in the coming months. The effect is exponentially higher than in a small training, and your organization can get into the doing right away. This does not only give your staff a stronger motivation and more satisfaction, it also increases your chances of succeeding and delivering your products to the market. Do not just go for any training. Go with the Scrum Transition Boot Camp. You will be able to go international with the same trainer team, to ensure all your facilities worldwide are on the same level. Combine this training with a department-wide rollout of Scrum and frameworks built on top. It allows for discussion with the engineers and serves as starting point for your success. Use this training for your own marketing purposes, e.g. for official advertising to be attractive on the employee market, by advertising the event at least internally, but also externally. Also, use this training as a reset point if you have been through an unsuccessful agile transition. This is the boldest statement you can make to admit that past things did not work out as intended, but you are committed to the overall goal. And remember, your Scrum training has to be tailored to automotive, and Elektrobit is the provider of expertise in automotive and agile. Lots of simulations and group works make it real for everybody. The teams define the role and identify the best fits for your specific organization. Your teams perform a self-assessment. All participants gain experience as a huge team, which is what you need to successfully deliver. The training itself has a common foundation, yet your organization will get a customized form of delivery that focuses on strengths and gaps where necessary. You can book add-ons in preparation or as continuation of the large training. 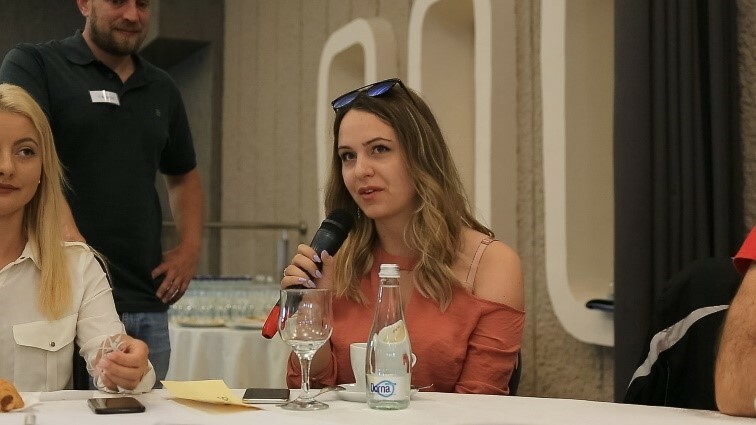 Talking about outcomes, you will reach a consolidated view across all your attendees, especially on the two questions: ”how do you want to act out the agile principles” and ”how should your Scrum Master, Product Owner and development team look”. The consolidation is part of the Scrum Master/Product Owner training module. 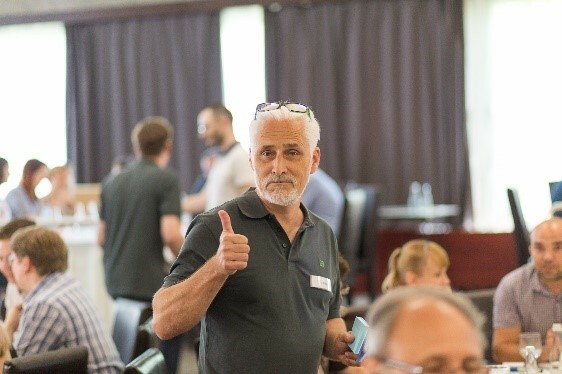 Furthermore, you get the outcome that really matters: larger groups – we work with groups of about 40 persons – who will have worked in Scrum together already. This is both a first step and proof that Scrum scales, without requiring one of the numerous scaling frameworks. This is also the answer to the common question, “Why not teach SAFe/LeSS/SoS/whatever immediately?” If you really want to transform your organization to become adaptive, self-sustained, and regularly deliver stuff, then the people need to experience Scrum first, before adding things on top. …if you want to really introduce agile and Scrum into your organization. …if you want to ensure everybody is exposed to real Scrum learning and experience. …if you want the training of your large organization to be done simultaneously and as fast as possible. 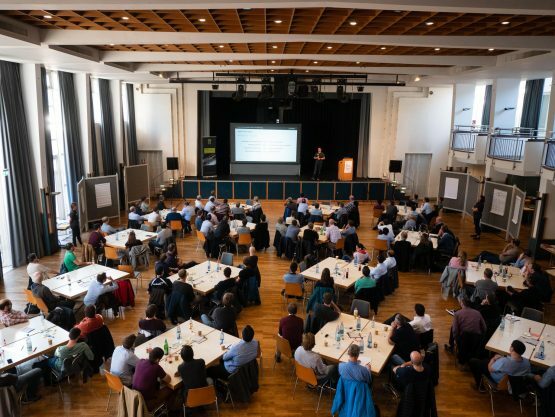 …if you want to enlighten your staff and demonstrate that you as a manager and management team are committed to the agile transformation of your organization.